Today’s agronomists are evaluated on how they help increase profit margins. Their insight is vital when making decisions about how to boost efficiencies in farm operations, drive yield intensification and decrease management inputs. To be successful, agronomists face many challenges. They must have access to the right data at the right time. In addition, they need a “complete view” of the ecological system on the farm, which traditional point sampling does not provide. 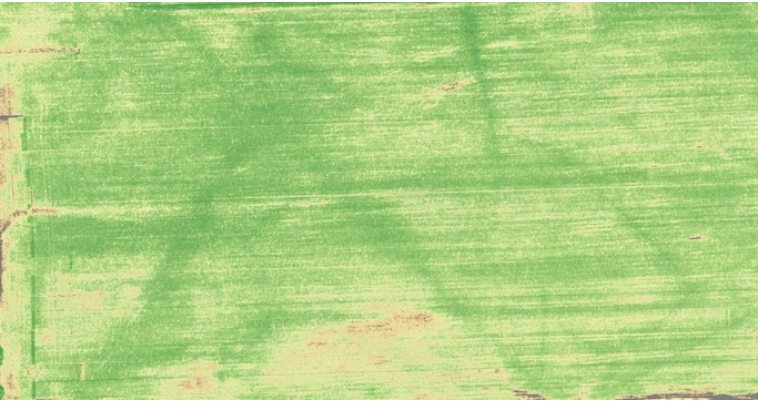 Many agronomists are discovering that drones are useful for more than high resolution images. When leveraged in tandem with multispectral sensors, they provide high quality data outputs for refined and quantitative decision making. “Drone-based multispectral sensing has many benefits such as accelerating data collection, enabling more ground to be covered and producing data results in hours. Typically, you can fly the drone in the morning and have actionable insight by afternoon,” shared Dr. Bobby Vick, a Solution Engineer at PrecisionHawk. With a Ph.D. in biological and agricultural engineering, Bobby has a passion for helping businesses in the agricultural industry leverage innovative technology to accelerate crop management. His clients include some of the world’s leading agricultural research firms. With early adopters seeing success, drone and sensor manufacturers are accelerating innovation to meet the growing needs of the agriculture industry. For example, the FireFLY6 PRO drone can cover up to 600 acres in a single deployment, which accelerates crop monitoring and farm management. Multispectral sensors are instrumental in plant health and management. They collect visible wavelengths of light as well as near-infrared (NIR) and red edge wavelengths. These narrow spectral bands (40-60 nanometers each) show the structural index of a plant and spot subtle changes in reflectance. “By the time plant stress becomes visible, it may be too late to take action. Multispectral sensors enable agronomists to identify stresses early on—when decisions can still be made to ensure crop health,” stated Vick. There are dozens of indices and composites you can generate with multispectral data. It is also possible to produce digital surface models that show the high and low parts of a field along with the chlorophyll and biomass layers. Multispectral sensors fall into two categories: single sensor or multi-sensor. Examining your use case generally determines which one will best meet your needs. Modified Multispectral Sensor have three spectral bands of light (ranging from 50 -150 nanometers each) and collect data through a single sensor. Modified multispectral sensors have incredible spatial accuracy and are well suited for plant counting and projects where high resolution aerial imagery is needed. In these sensors, the NIR band is a bit wider and so additional “noise” is collected alongside the multispectral data. To ensure accuracy, the data must be calibrated and processed thoroughly. “Modified multispectral sensors provide high spatial resolution. Customers like Everglades Equipment Group leverage them to perform plant counting and field inspections. You can detect differences plant by plant and leaf by leaf,” shared Vick. To secure both multispectral and visual imagery - you’ll need to fly over the area twice. These sensors contain four to five spectral bands and are manufactured specifically for securing multispectral data. Each spectral band is collected by a dedicated sensor so if your project requires both multispectral data and visual imagery - you’ll only need to fly over the area once. As with modified sensors, you can mix different band combinations. Purpose-built multispectral sensors deliver high spectral resolution and are best suited for large area analysis as well as projects that take place late in the growing season where examining individual leaves (or plants) isn’t critical. 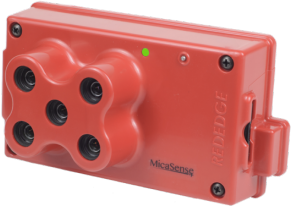 MicaSense is a company at the forefront of multispectral sensor development. Its RedEdge-MTM sensor contains five extremely narrow bands (10-40 nanometers each): blue, green, red, red edge and near-infrared. Recently, a California vineyard used RedEdge-M to reduce the cost of its weed detection by 50 percent while improving crop quality. You can secure visual imagery and multispectral data in one pass with a purpose-built multispectral sensor. However to get the spatial resolution of a modified sensor - you’ll need to fly at a lower altitude. Securing high quality data should always be your main focus. Start by fully understanding your data requirements and use cases (even before beginning project planning). To truly accelerate crop management decisions, multispectral data needs to be imported into your existing farm management system. Be sure to take this into consideration when purchasing a sensor or working with a service provider. Determine how to best analyze the data output and understand the type of files (such as KML, shapefile) you’ll need. For example, PrecisionHawk provides customers with data files that meet the specifications they stipulate. The company’s software also fully integrates with John Deere Operations Center for a seamless importing experience. Always factor the growing season into your flight plans as it impacts data fidelity. You’ll need to fly at a lower altitude at the beginning of the season versus at the end of the season. Develop a hybrid strategy that incorporates ground sampling and drone-based multispectral sensing. Use multispectral data to identify areas for ground sampling. Look for spots and regions that appear to be different. This ensures localized problems are identified (even in areas that your point sampling would never touch). Interested in getting your program up and running? 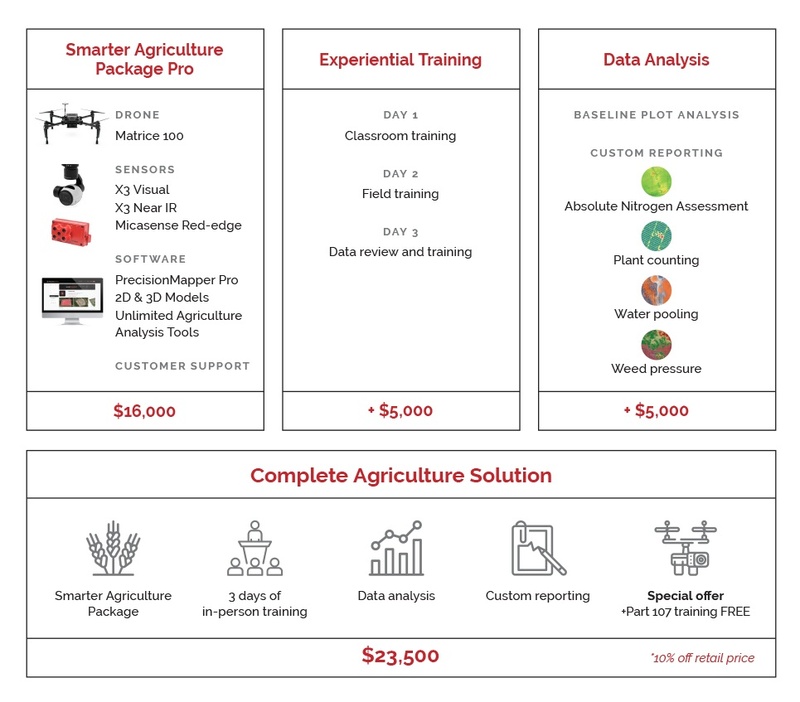 PrecisionHawk’s Smarter Agriculture Pro Package is a complete solution that includes training, data analysis and custom reporting. Discover why the world’s leading agricultural organizations rely on PrecisionHawk’s commercial drone expertise. Speak with a PrecisionHawk agriculture expert about the Smarter Agriculture Pro Package.